Here at Heaven’s Best Carpet Cleaning you will find some of the Highest Quality Upholstery Cleaners in the Birmingham, AL area. 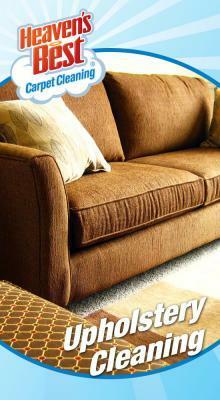 We specialize and have the expertise to clean virtually every type of upholstery including those more difficult to safely clean such as velvet and silk. Every piece is inspected closely to insure the correct technique is used and proper care. Our cleaning formula is the safest and most effective available to extend the life of your carpet and upholstery investment. Of course maintaining and caring for your furniture pieces requires a little bit of maintenance for the owner. As with carpet, you will want to keep your upholstery vacuumed and give immediate attention to spills. Then of course, you will want to treat it to a periodic professional cleaning every one to two years from a certified technician. Furniture manufactures recommend that you not wait until severe soiling occurs to have it cleaned, because the greater the soiling, the less likely it is to restore to the fabric’s original color, appearance, and texture. So, regular cleaning of fabric and leather furnishings by a trained and certified technician regularly can help restore your furniture and extend the life while keeping it looking like new. 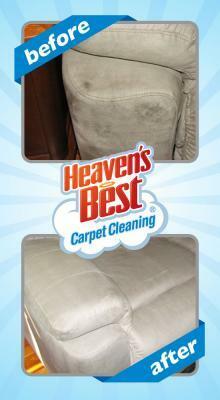 That’s exactly what you will find with your Heaven’s Best Carpet and Upholstery Cleaning company in Birmingham, AL. We have the Highest Quality Upholstery Cleaning System available with IICRC certified training and will be happy to help you get your residential or commercial upholstery needs looking great again. Give us a call today at 205-618-9150 and we will schedule a free estimate.